John Lockwood Kipling (1837-1911) was born in Pickering, Yorkshire. His interest in art and design was aroused by a visit to the Great Exhibition of 1851 and he later became involved in the decoration of the Victoria and Albert Museum; he is depicted in a relief panel on the pediment of the Museum's Lecture Theatre. At the end of 1864, he was appointed Architectural Sculptor, one of three new posts for artist-craftsmen at the Sir Jamsetjee Jeejeebhoy School of Art and Industry in Bombay; he later became its Principal. In the following March he married and a few weeks later set off for a new life in India. In December 1865 his first son was born and christened Rudyard after the place in Staffordshire where his parents had first met. As well as teaching, Lockwood Kipling made decorative designs for buildings in Bombay and even designed the uniforms and decorations for Lord Lytton's Imperial Assemblage of 1877, at which Queen Victoria was proclaimed Empress of India. In 1875 he was appointed head of the new Mayo College of Arts in Lahore, where he promoted traditional Indian crafts, which had been declining in the face of cheap European imports. In 1870 Kipling had been commissioned by the government to tour the North-West Provinces and make a series of sketches of Indian craftsmen. 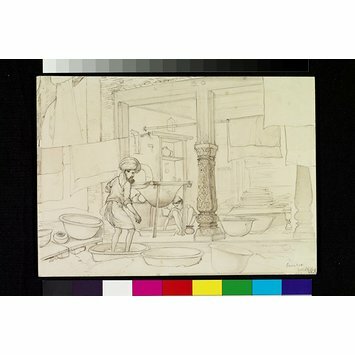 This one, depicting a dyer’s shop in Cawnpore (Kanpur), was drawn in November 1870. Two turbaned men working in a dyer's shop. Surrounded by material hanging on washing lines, one man is standing in a large bowl containing cloth in order to absorb the dye. Next to a large decorated pillar lie other bowls and baskets. 51. A dyer's shop, Cawnpore, Nov 1870. Historical significance: John Lockwood Kipling (1837-1911) was born in Yorkshire but as his career developed became an established artist and scholar, and in 1865 settled in India with the family. He became professor of architectural sculpture at the JeeJeebhay School of Art in Bombay and in 1882 curator of the Lahore Museum. During his career JL Kipling was a member of the Department of Art and Science at the Victoria and Albert Museum and was also involved in the museum's decoration. John Lockwood Kipling was the father of Rudyard Kipling, author of the famous novels Jungle Book and Kim. 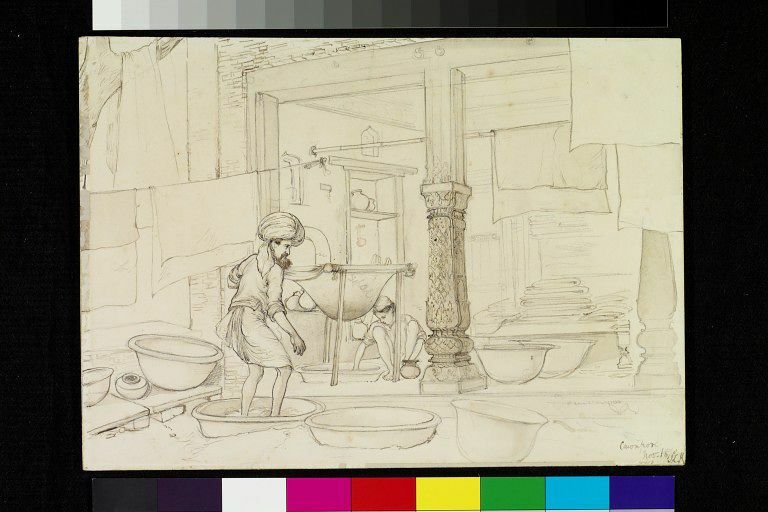 Drawing of two turbaned men in a dyer's shop, Kanpur.1870.